A four part series of articles providing information on all aspects of bulb planting and care. With fall on the way, it is time to consider planting bulb flowers that we want for spring blooming. 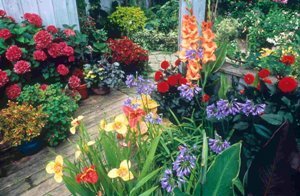 Flower bulbs are one of the best flower investments for the cost, properly cared for they will provide spring color in your garden for years to come. Flowering plants grown from bulbs work in small container gardens on balconies or patios, as shown in Figure 1, and they work in vast open spaces, as shown in Figure 2. 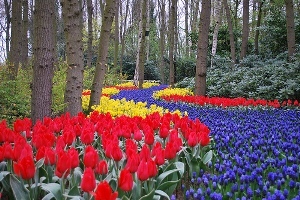 Holland is synonymous with tulip bulbs, having created hundred's of hybrid plants over the last few hundred years. Many of these hybrids have been produced to allow bulbs to be planted in an ever increasing host of geographic climates. They are hardier, less prone to disease and are a reliable perennial plant. Planting and cultivating flowering bulbs is as easy if not easier than planting flowering seed plants. Plant in the correct season. Flower bulbs bloom and expand naturally. Maintain the soil and moisture and you will have a beautiful garden each and every year. Table 1 provides a planting schedule for flowering bulbs. By planting a sequence of spring, summer and fall, flower bulbs at the appropriate time, you can enjoy their blooms practically year around. In all regions, store potted bulbs in refrigerator for forcing indoors. Store tulips, crocus and hyacinths in refrigerator for 6-8 weeks before planting. In all regions, remove sprouted bulbs from refrigerator for indoor forcing. Plant pre-chilled, hardy bulbs outdoors.